On the drive between the famous New Mexican towns of Roswell and Carlsbad you might glimpse into the small town of Artesia but think there's not much to draw you in. Wait, don't hit the pedal and keep going. Turn in to town and stroll the streets for a rewarding couple of hours. They have done a wonderful job of highlighting their history and heritage with public art throughout the town. There are large sculptures themed to honor their hard action history of cowboys, cattle drives and the oil industry. There is also artist Robert Sumners sculpture of the 'First Lady of Artesia,' Sallie Chisum. She was a family member of the renown Texas cattle baron, John Chisum, and a dynamic force in the town. Among other things, she started the first post office, was an entrepreneur and business women with many interests. Plus she displayed a strong charitable side and helped many in need. There is a small colorful park, the Heritage Walkway and, in the new state of the art library, a large scale mural by the famous local New Mexico artist Peter Hurd, partner and husband of Henrietta Wyeth, from the famous East Coast artist family. Three sculptures make up the story of the Cattle Drive and they are all action. They neatly tell the story of the people and the animals as they rode through the area and the role they played in the development of the area. First there's The Trail Boss - the man in charge. The scene depicts him springing to the defence of his herd after the vaquero has alerted him to a rustler trying to steal some of the cattle. Secondly The Vacquero (Spanish for cowboy) honors the Hispanic cowboys who played an integral part in the history of the area and their influence on the language of the West. 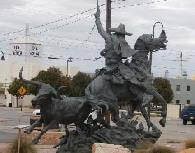 The sculpture depicts the Vaquero as he sees a rustler attempting to steal cattle. The last in the series, The Rustler acknowledges the human frailties by highlighting the bad guys. And plenty of bad guys feature large in Western history. This sculpture shows the rustler as he is preparing to rebrand a calf when he realizes he has been seen and is reaching for his guns. Partners is a delightful piece of oil and gas business men, Mack Chase and Johnny Gray, who most often held their meetings leaning on the hood of a pick-up and sealed deals with a handshake. Their businesses are still in operation today. The tale of Woman's Intuition is a fascinating glimpse in to how things can turn on a whim. After a couple of unsuccessful attempts in drilling for oil, an exasperated oilman, Martin Yates, turned to his wife and asked her to select a site to drill. Mary Yates randomly pointed to a spot and said, "Drill there." They did, out gushed the oil and their fortunes changed dramatically. Their children and grandchildren still run the company. The Heritage Walkway is a tranquil and colorful small park right on Main Street and a good spot to have a picnic as you contemplate the art within it. The walls are adorned with murals depicting the diverse cultures, the Native American, Hispanic and Europeans, who have moved through and settled the area. Two of the murals were created by the Artesia Junior Women's Club back in 1976. When the Artesia MainStreet organization took over maintenance and started renovation, the two murals were touched up and the third mural by local artist Noel Marquez was added on the "Wonder Wall." The name emerged because for quite some time the locals pondered, "I wonder what should go on that wall?" Finally, Marquez' excellent landscape of the surrounding desert was implemented. There are bubbling tiled fountains with decorated sluices running between them and clearly highlight the areas Hispanic heritage. The sluices decoration depicts the farming and ranching heritage with beautiful, bright tiles of animals and vegetables handcrafted by Shel Neymark, a New Mexico ceramist. There are plaques throughout the park giving details of all the artwork. The town puts out a descriptive walking tour booklet (download from the Chamber website) which list more artistic and historic places of interest like the Ocotillo Performing Arts Center and the renovated Land of the Sun Theater, which is back in operation. Roswell may have it's aliens and Carlsbad it's incredible caverns, but little Artesia should not be overlooked. Their public art is a beautiful example of story telling and provides a fascinating look in to the heritage and history of the town. Their pride in their diverse heritage is uplifting to witness.